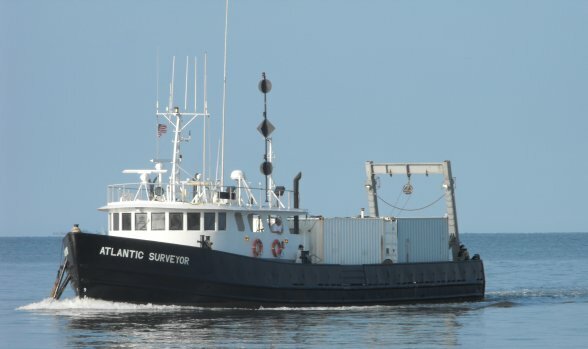 The Atlantic Surveyor is a versatile ship with extensive experience supporting many types of marine operations including hydrographic survey, post and pre-lay route survey, dive support, submarine cable repair & installation, scientific research, archeological investigation, obstruction removal, and vibra-coring. Our customers include the U.S. Navy, Oceaneering,Intnl, U.S.Geological Survey, U.S.Coast Guard, Horizon Offshore, Rutgers University, N.O.A.A., Virginia Institute of Marine Science, Stolt Offshore, Woods Hole Oceanographic Institute, and many others. The Atlantic Surveyor is US Coast Guard inspected and certified.